Book an appointment for all your INFINITI mechanical and maintenance needs. If you are an INFINITI owner, you can trust Morrey INFINITI for all of your after-sales servicing and maintenance needs. Our dedicated team of service consultants strive to ensure your satisfaction at every visit, and our trained and experienced team of technicians will keep your INFINITI running perfectly for as long as you want to keep it on the road. From simple maintenance to complex repairs, Morrey INFINITI uses only the finest technology in state-of-the-art facilities. We also take the time to explain the service that will be done to your vehicle so that there are no surprises. While you wait for your INFINITI, relax in our welcoming lounge or ask for a shuttle service that will allow you to get on with your day. 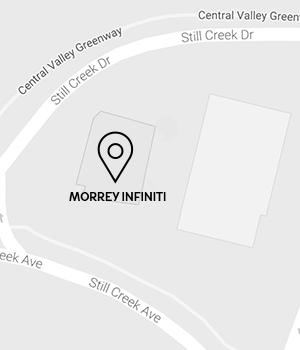 At Morrey INFINITI, everything is put in place to ensure your satisfaction. You can book your appointment online, or contact us today at 604 676-6973 to learn more about our range of after-sales maintenance services.